Capodimonte is a small area of Naples situated near the park of the same name. Lost in the upper part of the town, Capodimonte became famous thanks to local craftsmen who have handed down the how-tos of Capodimonte porcelain production through generations. 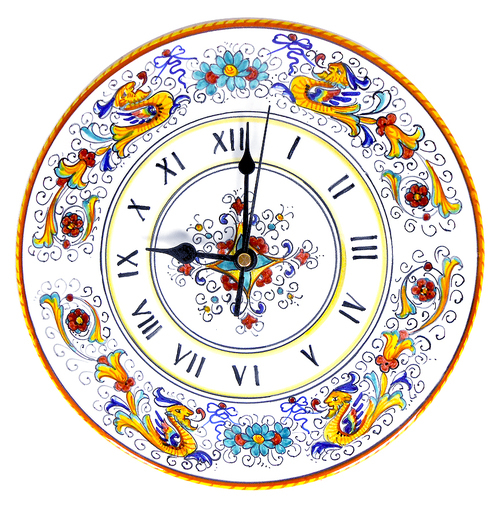 The ancient tradition of porcelain production dates back to the 13th century in Europe. This delicate art only became known in Europe after china was brought over by travelers and explorers from Asia. After the arrival of those first examples of china, Europeans began attempting, and failing, to make their own. Until the18th century, that is, when alchemist Johann Friedrich Bottger ended up under house arrest. It was Bottger who discovered the constituents of porcelain. Once Bottger made his discovery it was only a matter of time before factories began springing up all over Germany. It was also during this time that the tradition of Capodimonte porcelain began. It was in time when the House of Bourbon was prominent, when Naples was assisting with the birth of the Real Factory (La Real Fabbrica), which was founded by King Charles of Bourbon and his wife. The king’s aim was to assist the production and trading of porcelain. The porcelain tradition continued to be encouraged by Charles’ son, Ferdinand IV, who decided to found the Real Fabbrica Ferdinandea. In this period many artists were grouped together in order to develop the art of porcelain. The peak was reached under the artist Domenico Venuti, who contributed to the creation of masterpieces that are now stored in the Museum of Capodimonte. After the French rose to power the Real Factory was given to a group of private investors who agreed to continue production as long as the French royal court was willing to buy most of it. The French didn’t keep their promise and so Capodimonte porcelain went through a slow period in which demand wasn’t as high as it had previously been. Despite the slow-down Neapolitan artists went on producing new figures and objects made of Capodimonte porcelain, most of which represented daily scenes enjoyed by local bourgeoisie and tourists. Over the course of time this style was replaced by a new and more widely-appreciated one. Flowers and more sober drawings replaced the lavish style used in the past. It is this style that keeps Capodimonte porcelain famous throughout the world. Unlike that of many Northern European producers, Capodimonte porcelain is not a fusion of kaolin and feldspar, a chemical binder. The porcelain’s unique composition makes it not only special but also inimitable. Because kaolin couldn’t be found in the south of Italy, Capodimonte porcelain was and still is created using a mixture of local clays added to feldspar. If you’re looking for genuine, quality, and unique procelain pieces, look no further than those produced in Capodimonte.